The evening’s line-up of entertainment will be compered and features a full support programme. Additional artists will be announced nearer the date. Peter and Chris Troup, the promoters of Rockin’ the Dock through their event management company Mousehound Events Ltd, are bringing this fabulous live music evening to Cowes as a pre-cursor to Aberdeen Asset Management Cowes Week that takes place from 6-13 August. According to Chris Troup, the Quo concert will help generate the necessary funds to enable Mousehound Events to provide a line up of high quality and, importantly, FREE entertainment to Cowes Week competitors and the local community. Chris is excited to be providing this amazing opportunity for live music fans to see and listen to one of the world’s greatest rock bands in the relatively intimate setting of Cowes Yacht Haven. “To be able to bring such an incredible line-up to Cowes is really positive and exciting, and especially so because in recent years we have needed to elevate the level and quality of entertainment in the Yacht Haven during Aberdeen Asset Management Cowes Week. A marketing campaign is being rolled out using local and regional print advertising, Facebook and other social media resources. A maximum of 4,800 standing only tickets will go on sale on Thursday 14th April through a variety of outlets. The ferry operator Red Funnel is providing an inclusive travel and entry ticket deal for £40.00 and Mousehound Events are making a corporate/VIP package available. Early bird tickets will be on sale for £32.50 each until 31st May. There is a limit of eight tickets per person. From 1st June tickets are priced at £38.00. There will be full catering and bar facilities on site. Gates open at 5pm with a DJ looking after the music proceedings until the first support band, scheduled to play from 7pm. 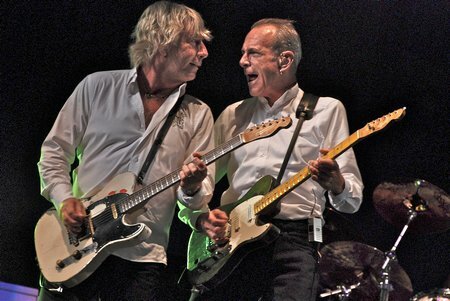 Status Quo is scheduled to play from 9pm – 10.30pm.